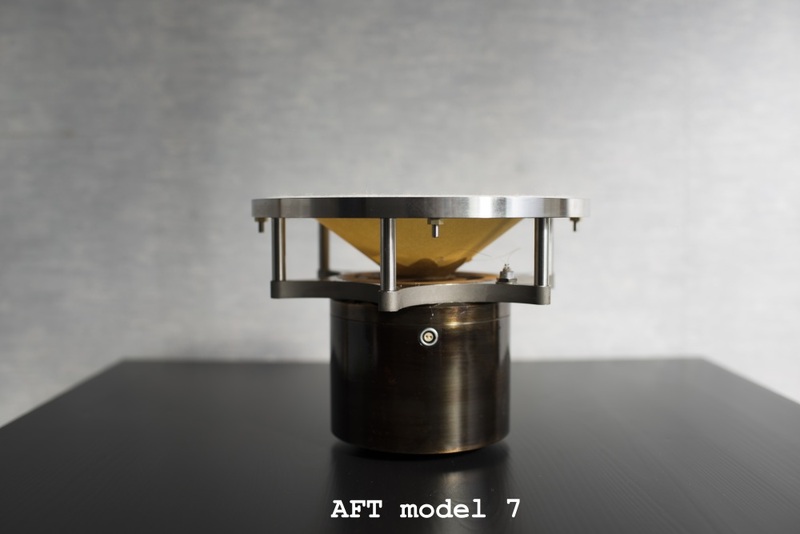 AFT (Audio Feast / Teramoto) model 7 is our first full range field coil speaker. These speakers are specially hand crafted to our specifications by Mr. Teramoto. Audio Feast is the exclusive world wide supplier for the AFT model 7. We have two dealers, one in Japan and one in Hong Kong (for customer service in Mandarin). Direct sale is to reduce cost. We are trying to supply the best product with the lowest cost directly to our costumers by reducing the middle men. Mr. Teramoto is the man behind the legendary Feastrex. He is the one and only master craftsman. AFT model 7 uses a pure iron magnetic circuit, stainless steel frame, and hand crafted washi papers. In the USA, the same paper can be seen at art museums such as the Museum of Fine Arts in Boston. Boston's collection of Hokusai paintings uses the same paper. Ichibei-san supplied the paper to the museum to restore the paintings. Why? His family supplied the same paper hundreds of years ago to Hokusai! The main diaphragm, whizzer cone, damper, and diaphragm edge are all made from hand crafted washi. Specially selected copper wires are used for both the voice coil and field coil. No chemical paint. No plating. In the past, we tried gold and other plating. But having dissimilar metals does something: they did not sound good. No paint on pure iron had much better results. However, it was not easy to prevent rusting. We found an organic, effective way to protect it: the Urushi finish! The outer frame diameter is 199 mm (7.8"). The moving assembly is very light and weighs almost the same as the typical 5" washi speakers. The washi edge is very soft. MSRP: $7,660 (840,000JPY) a pair. We need about 3 months before shipping.